MWS 501, BIB 501A, BIB 501B, WR 501, and DWS 701 are using Canvas instead of Moodle for the June 2019 semester. All other students will continue to use Moodle as they have in the past. Begin by signing into Canvas. There is a link at the top of the IWS website in the Quick Links menu, and you can always navigate to the easy-to-remember URL canvas.iws.edu. Enter your @iws.edu username and password (your Populi or IWS email password), and you will be taken to the Canvas Dashboard. You can always click the IWS shield icon to go back to the Canvas home screen (or the Dashboard button). Canvas won’t let you change your password, since it’s linked to your Populi account. You can change your password in Populi, though, and it will immediately take affect in Canvas. We will call the dark-background bar with the IWS logo and icons in a vertical column the Main Navigation Bar. Navigation within a section or course will appear to the right of the Main Navigation Bar. Note the “To Do” items that will appear on the right hand side of the dashboard, based on how your professors have set up your courses, and any feedback for you to view will show up beneath the To Do items. Why don’t you go ahead and follow along? Open a new new browser window or tab for Canvas, sign in, and open up a real course? 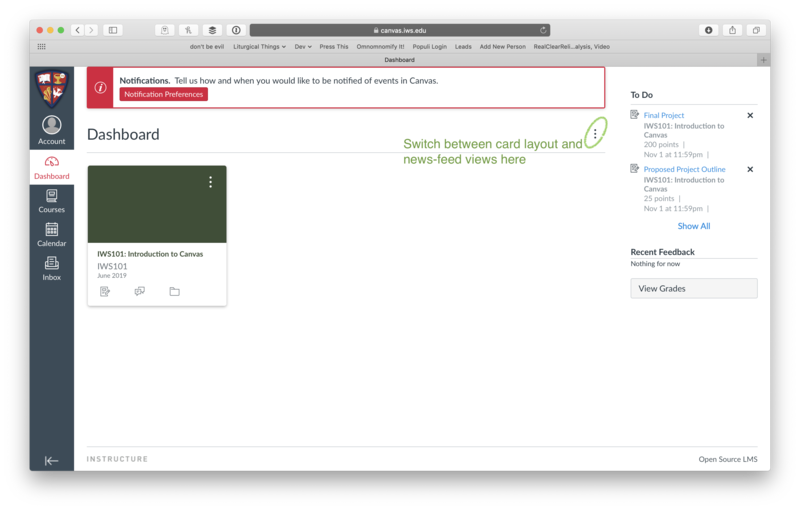 The canvas link in this step #3 will automatically open in a new browser tab.